HP LaserJet 4000 Series Toner Cart., 10K Pages (C4127X) : Disk-O-Tape, Inc. The HP C4127X Ultraprecise Print Cartridge prints approximately 10,000 pages and is perfect for medium to high volume users who value the added convenience of increased output and a lower overall cost of ownership. It is designed for the HP LaserJet 4000 and 4050 Series printers to ensure optimum print quality. Yield: 10,000 pages, based on 5% average coverage. Designed to work precisely with HP LaserJet 4000 and 4050 Printer series. 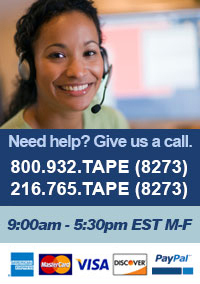 Designed to work precisely with HP LaserJet 4000 and 4050 series Printers. HP Ultraprecise cartridges set the standard for optimum quality output. 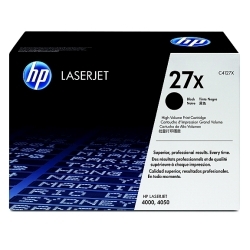 The HP 27X Black LaserJet Toner Cartridge offers 65% higher capacity for excellent value—20% cost-per-page savings. With features like dual polymer toner particles. helical roller drive, magnetic seals, and HP Pull Tabs, HP Ultraprecise cartridges set the standard for optimum quality output.